Safer Internet Day is recognised in over 100 countries, and highlights positive uses of technology and the role we all play in helping to create a safer online community. It calls upon young people, parents, carers, teachers, to get involved and play your part! Save and print this to write your own message for the day! You can get involved as students or parents by making a pledge and posting online using the above background about something you can do that is positive to do with internet use. Follow this link to download the full guidelines. You can fill in the tablet with your message or pledge to create a better internet, or a message conversation that demonstrates how someone could ask, give or receive permission online. 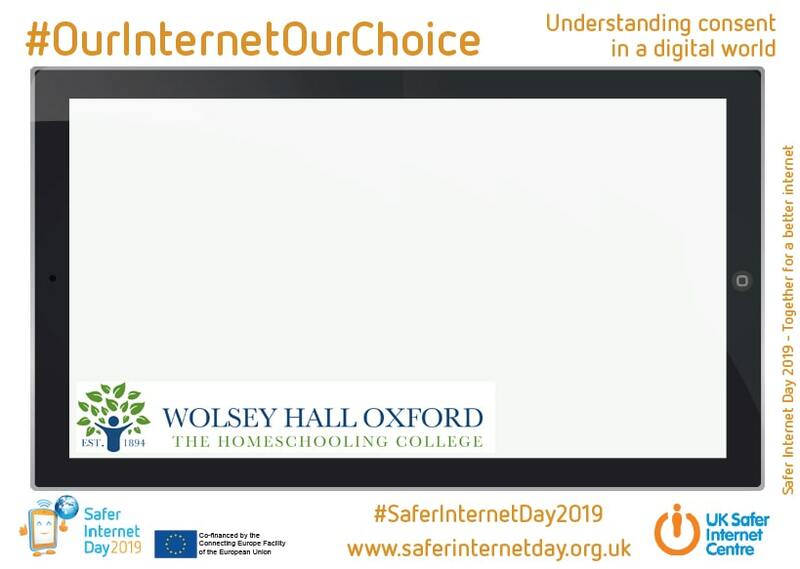 Take a photo of the templates and share on your Twitter, Facebook, Instagram and any other social media accounts with the hashtag #OurInternetOurChoice and @wolseyhalloxford #wolseyhalloxford. We would love to see how you have used the templates to create a display in your setting! Get your friends, family, and colleagues involved! Here are some TOP TIPS for online safety for various age groups. QUIZ – click here to check your safety status. Here you can download education packs relating to the day. As a college, we have registered as an official supporter here. We control the use of internet for our kids (iPad) at home by setting up a family sharing where my husband controls what they can browse on the internet. There is a parental control where it needs permission from the parents to download apps.Part of parental control is filtering the search engine and youtube or any websites. If inappropriate words are entered, it would then appeared blocked. We do the same for all the games they play.We let them play games online that is according to their age.